According to the IDC Worldwide Quarterly Tablet Tracker, Apple's tablet share to dip to 29.6%, its lowest share to date. 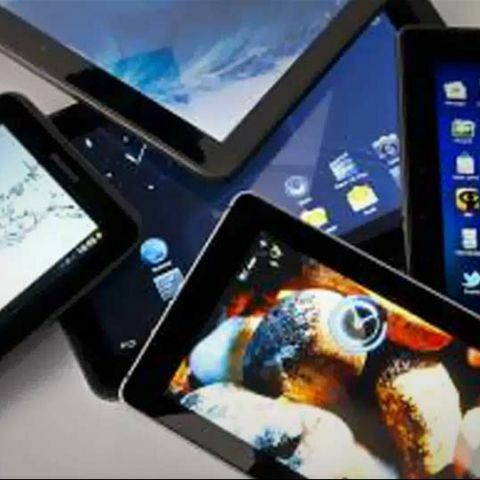 Global tablet shipments have grown to 47.6 million units in the third quarter of 2013, says the latest the International Data Corporation (IDC) Worldwide Quarterly Tablet Tracker. Despite marginally below IDC's predictions, stats still suggest a 7.0 percent growth over the previous quarter and 36.7 percent growth compared to third quarter of 2012. IDC says Android devices have driven the shipment growth, while iOS growth stalled. Windows tablets are yet to win over consumers. Apple saw a quarter-over-quarter decline in shipments from 14.6 million in 2Q13 to 14.1 million in 3Q13, mainly because of no launch of new iPad product in the second or third quarter. Year over year, iPad shipments grew less than one percent. IDC says Apple's declining shipment is mainly because of its strategy to roll out new products in the fourth quarter. This has caused its tablet share to dip to 29.6%, its lowest share to date. However, its share is expected to grow in the near future with new iPad Air and the refreshed iPad mini with Retina shipping this month. "With two 7.9-inch models starting at $299 and $399, and two 9.7-inch models starting at $399 and $499, Apple is taking steps to appeal to multiple segments," said Jitesh Ubrani, Research Analyst with IDC's Tablet Tracker. "While some undoubtedly hoped for more aggressive pricing from Apple, the current prices clearly reflect Apple's ongoing strategy to maintain its premium status. It's worth noting that Apple wasn't the only one to increase the price of its small-sized tablet during this product cycle: Both Google and Amazon increased the price of their newest 7-inch tablets from $199 to $229 to cover the higher costs associated with high resolution screens and better processors." Samsung has maintained its second position with shipments of about 9.7 million units. ASUS, which makes Nexus 7 for Google, has shipped about 3.5 million total units during the quarter for a third place and 7.4% market share. 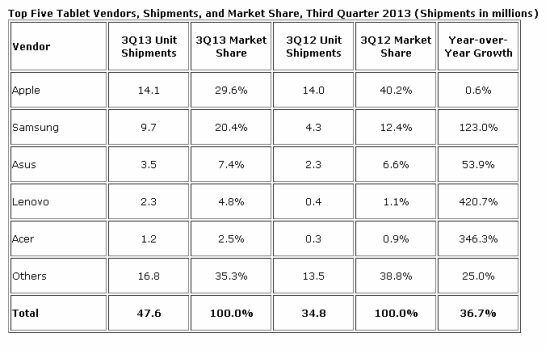 Lenovo has grown to number four tablet spot with shipments of 2.3 million units and a 4.8% share. "White box tablet shipments continue to constitute a fairly large percentage of the Android devices shipped into the market," say Tom Mainelli, Research Director, Tablets at IDC. "These low cost Android-based products make tablets available to a wider market of consumers, which is good. However, many use cheap parts and non Google-approved versions of Android that can result in an unsatisfactory customer experience, limited usage, and very little engagement with the ecosystem. Android's growth in tablets has been stunning to watch, but shipments alone won't guarantee long-term success. For that you need a sustainable hardware business model, a healthy ecosystem for developers, and happy end users."